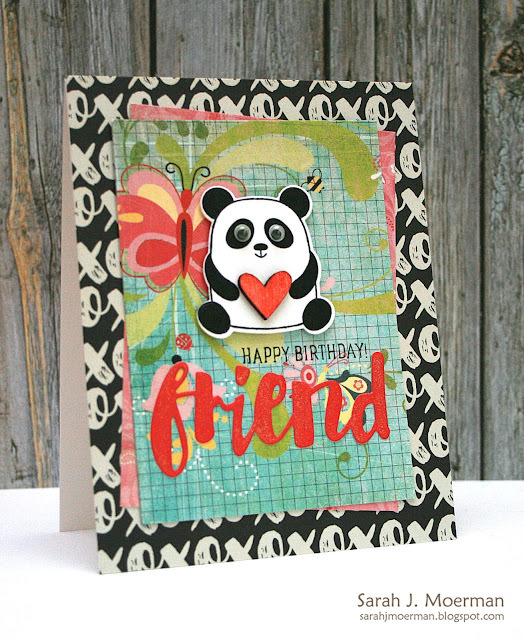 SSS Birthday Panda Card & August Card Kit Winner! 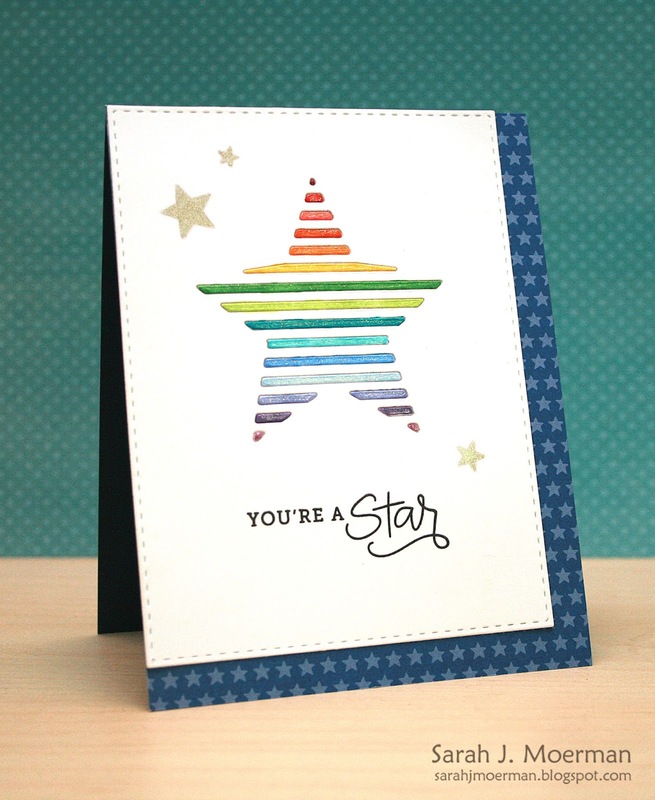 I'm stopping by to announce the winner of the fabulous Simon Says Stamp August Card Kit: Seeing Stars and to share a birthday card featuring a real cutie. That is so cool. I love how the color pops out against the kraft. Congrats Sheri! Please contact me via the contact button on my sidebar with your mailing info so I can pass it on to the wonderful team at Simon Says Stamp! I love how he pops on the layers of patterned papers. I paired the xoxo paper from Simple Stories Life in Color with some older BasicGrey papers. I couldn't resist giving this cutie some Googly Eyes and a little Copic-coloured Wood Veneer Heart to hold. The sentiment combines Simon's Circle Sayings Stamp Set with their Painted Friend Die which I coloured with a Clear Wink of Stella Glitter Marker. I'm back to share a final card using the fabulous Simon Says Stamp August Card Kit: Seeing Stars! I die cut a piece of Simon's 120 lb White Cardstock using Simon's Stitched Rectangles Dies and then die cut Simon's new Vented Star Die from it. I coloured all the little strips with Copic Markers followed by a Clear Wink of Stella Glitter Marker. I adhered all the pieces together on some Pebbles Americana Patterned Paper and adhered that to my card front. I stamped the sentiment from Simon's Seeing Stars Stamp Set with Versafine Onyx Black Ink Pad and the little stars with Simon's Fog Ink. Finally, I colored over the little stars with a Sakura Stardust Clear Glitter Pen. If you're interested, you can pick up the Simon Says Stamp August 2016 Card Kit for just $29.95 + shipping. If you'd like to receive this kit and future kits for only $24.95 + shipping per month, you can SUBSCRIBE HERE. Heidi, owner of Simon Says Stamp, has given me an extra August 2016 Card Kit to pass on to one of you! Just leave a comment on any or all of my August Card Kit posts and I'll announce a winner Wednesday July 27th. 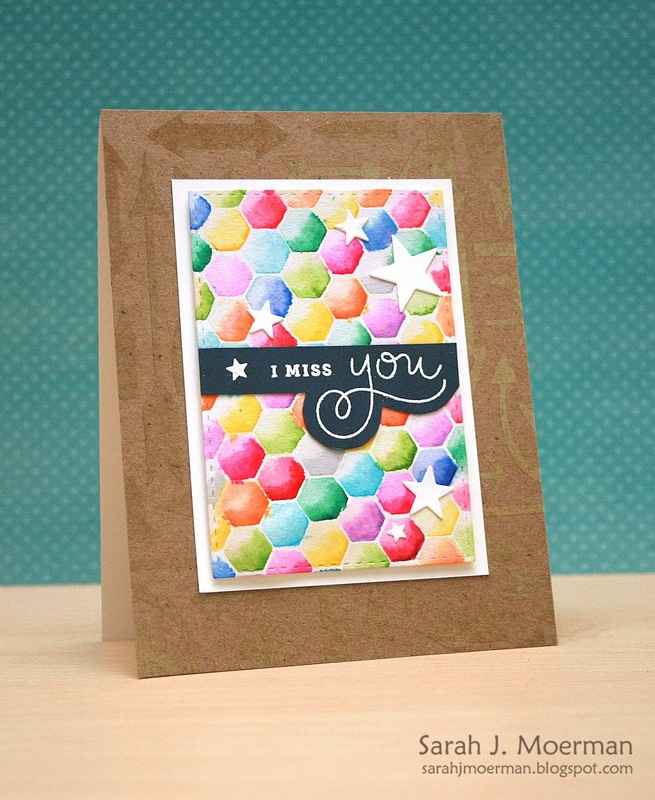 Simon Says Stamp August Card Kit: I Miss You, GIVEAWAY, and sales! 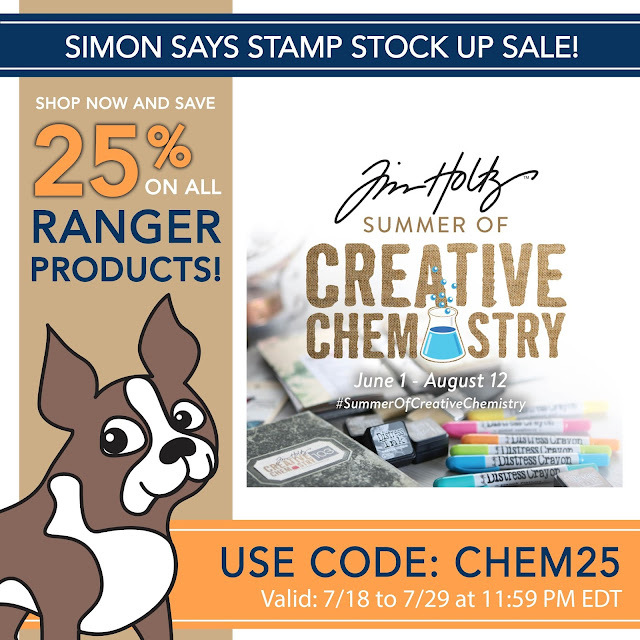 I'm back to share another card using the fun-filled Simon Says Stamp August Card Kit: Seeing Stars and also to let you know that Simon has a couple of AMAZING sales going on right now! I die cut a piece of the white hexagon-patterned Tim Holtz Mofit Cardstock with one of Simon's Stitched Rectangles Dies. I then used a number of Zig Clean Color Real Brush Markers and the Small Watercolor Brush Pen from another of Simon's recent Card Kits and coloured in the hexagons. I white heat embossed the sentiment and a small star from the Seeing Stars Stamp Set onto Simon's Soft Navy Cardstock, trimmed it, and adhered it to my dry hexagon panel. Using Foam Tape, I adhered the panel to a piece of Simon's 120 lb White Cardstock before adhering it to a kraft arrows-patterned piece of the Tim Holtz Mofit Cardstock cut down to fit my card front. Finally, I embellished the card with some stars cut from Simon's Holiday Shapes Dies and Large Holiday Shapes Dies.